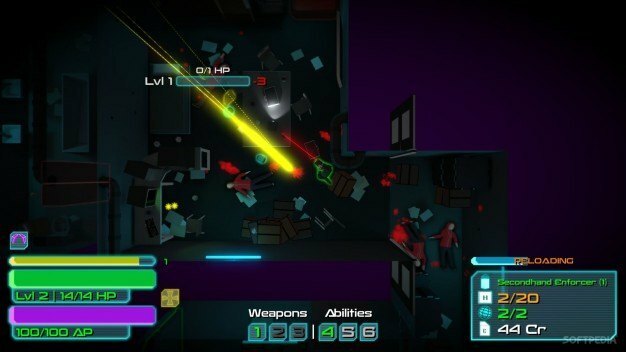 Firing up Defragmented feels like a Doctor Who-type journey through a time warp taking you straight back to a neon cyberpunk 80s. Fluorescent greens and reds blind you as you land at the initial interface, complete with pink blurring to blue background, blocky typeface and funky synth music. It’s a top down action shooter RPG developed by a largely two man team under the name of Glass Knuckle Games. 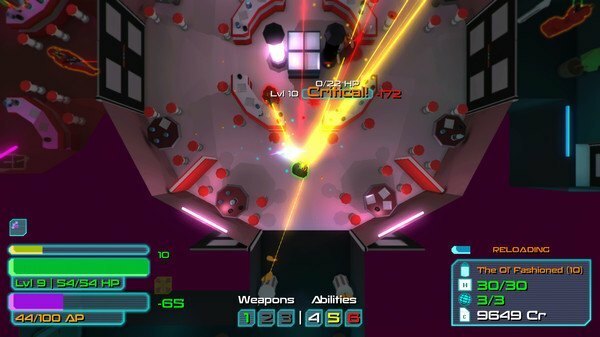 With a gameplay experience that feels like a slightly unrefined Hotline Miami, and a soundtrack that belongs on a cassette tape, Defragmented takes you on a dystopian journey through the technological future of Entropolis. One thing very quickly becomes obvious as you delve in – this is a story told through dialogue rather than action. The ominous presence of a random 2nd person narrator telling you your own backstory, thoughts, and actions leaves the player feeling slightly out of the loop and unashamedly self-conscious in the opening sequences. It is only when other characters begin speaking that you can settle into your role as active participant in the game, rather than being instructed on how you act and move. It’s a strange plot tactic that requires some getting used to, however it plays nicely on the use of the imagination to fill out a lot of story progression in a very short space of time and serves to intensify the flow of the game overall. There is one key break down to this flow, however. There seems to be a disconnect between the world of the dialogue and the world of the art. For example, when I was told I was in the “bustling metropolis of city,” I was in fact standing in a desolate street in the pouring rain. This is my main point of contention with this game. Much of the plot hints that the player shouldn’t feel too comfortable entrusting themselves to any one faction – the question of who is right is largely up for debate and is one of the reasons the plot holds more depth than the surface suggests. So the discrepancy between what the player is being told by the leader of one faction, or a mysterious narrator, and what the player sees for themselves could possibly be a playoff on this idea. It would have been nice, however, to see some of this ambiguity in the actual combat missions and not just the heavy plot interludes. Aside from its complex plot of trickery, definitions of “terrorism,” and rhetorically aggressive benefactors, the missions themselves present a stark departure from the backseat passivity of the dialogue. 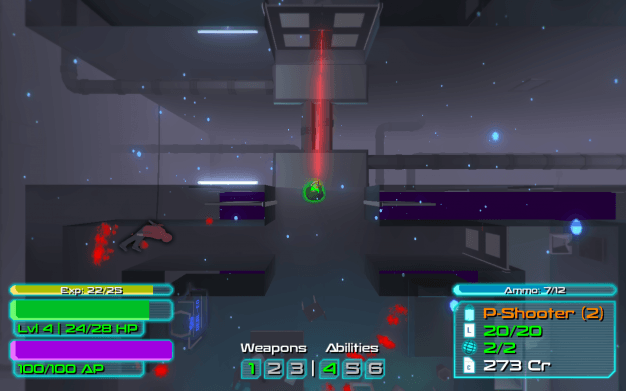 Though they usually run off the same mechanic – clearing a building of enemies and/or hacking into a database – the controls are intuitive and natural, and the maps themselves are designed to create unique challenges with every attempt. Looting your way through these maps provides charming incentive to explore and get nosy, and there’s constant opportunities to upgrade to more powerful weapons. Damage is the main difference between weapons. Unfortunately, when a gun says it has low accuracy it means it will spray bullets anywhere but where you’re clicking. This makes early gameplay extremely frustrating, especially when you have an enemy running at you with automatic artillery. However, you quickly build an arsenal of badass firearms. If you do find yourself wounded, there are health points to be found around your location but they are rare. Even with health points, it is unlikely that your health bar will replete even half way, so stealth and well conceived tactics are the order of the day. This function does impede gameplay in some instances, when control over your health bar is completely removed from gameplay through the lack of health points, and the quest becomes a suicide mission. If you do die, though, respawn is lightning fast and can get you straight back into the heat of battle in seconds, minimizing instances of rage quitting. Abilities such as the power smash are strong and can be easily employed in the control system while guns feel a lot more instinctive and are faster to button-smash. Another system that works particularly well is the assignment of three weapons in your inventory to corresponding numbers on the keyboard allowing for quick swapping of tactics during gunfights. While this combat gameplay gets by in its overall functionality, it is often brought down by some unflattering extraneous elements. While often only presenting small infractions, these idiosyncrasies quickly build into a frustration that has the potential to detract from the experience as a whole. Enemies, for example, differ in their difficulty which, while allowing for an extra dynamic of gameplay, are not indicated to the player. This hinders strategy, leaving the player generally unaware of what they are facing. More annoying perhaps, is that when selecting a mission from the main menu, the player must sit through the preceding dialogue once again. This is nice for returning to a session after a long break, but incredibly boring when playing straight through for more than twenty minutes. The talent branches also present a strange and relatively illogical system. Two vertical lines of upgrades seem to work in unison with one another; you cannot move onto fulfilling the next talent without a certain number of skill points being spent on the other branch. It’s a bizarre approach that I haven’t witnessed in other talent branch mechanics, which usually let the player chose which ability lines to prioritize over others. This trend of generally inviting features undercut by a build up of small but deadly flow-killers continues in the design of Defragmented. 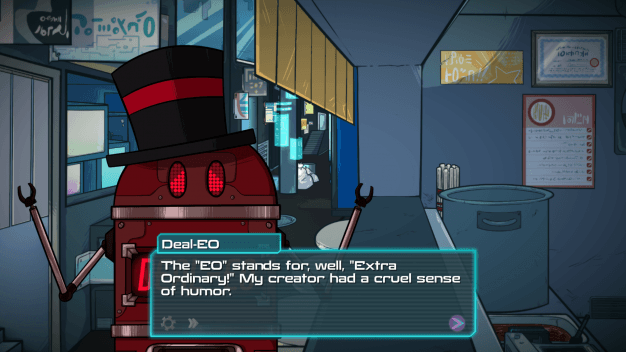 The brilliantly simple techno-cyberpunk art style in missions, characters, and background artwork creates a sensationally dramatic atmosphere. Coupled with the flawless pulsing of the synth soundtrack, the story and combat has an aesthetic life force that breathes its own flare into the experience. It’s when you get into elements of the design that interweave with the gameplay itself however, that things get a bit deflated. The gravity mechanics and super-sensitivity of surrounding objects to your touch (meaning a table will crash around the room if you so much as nudge it), do not do well under the confines of a fairly dark top down floor plan. 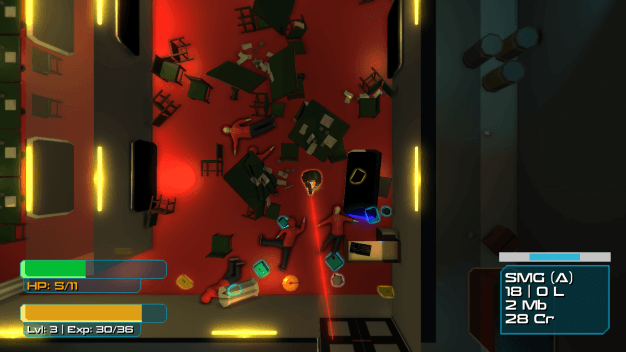 Not being able to see the obstacles around you, coupled with their tendency to fly across the room, creates situations where the player finds themselves trapped in a corridor – barricaded by desks and barrels that they somehow managed to bring with them, or having to fight their way through office equipment to pick up an ammo pack dropped by an enemy. From attempting to work out which objects you can shoot through, to trying to leave an office block – this certainly presents challenges I don’t think the developers had in mind. Defragmented is certainly atmospheric. With a detailed and twisting plot that requires the players’ own imagination and cognitive interaction in developing a hypothesis over who to morally stand with, enchanting 80s vibes achieved through simple graphical feats and a soundtrack of racing rhythms and intense focus – on the cover it looks like a fantastic experience. It is however, the build up of small frustrations, idiosyncrasies, and overall rough edges that detract from this gameplay. In Defragmented I see what could be an enthralling flow of experience drastically dragged down by small technical and structural interruptions. That’s not to say it can’t improve with updates however.